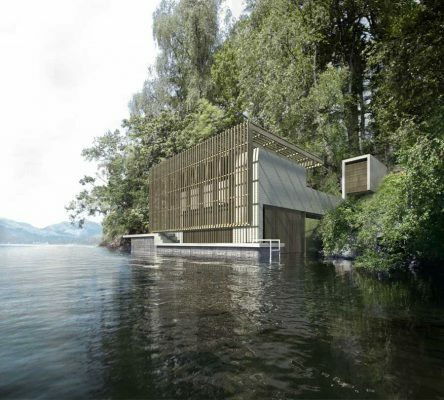 Sutherland Hussey Architects have recently been awarded planning permission to construct a new boathouse on the shores of Loch Ard near Aberfoyle. Set in the breathtaking Loch Lomond and Trossachs National Park, a space for meditation will hover above the loch to catch the stunning westerly views. 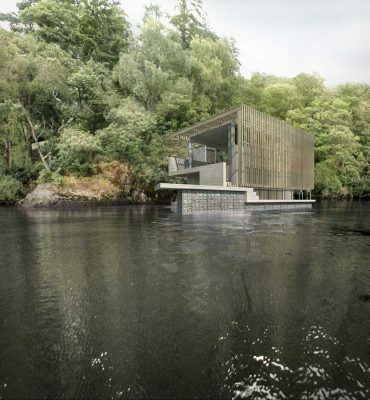 To the south, a slatted timber screen protects the space from the intense sun, reflected from the shimmering surface of the water whereas views back to the shore are of ancient oaks and moss covered rocks. Beneath there is secure storage space for boats and kayaks with a small pier giving access to the loch for diving and swimming. The building is linked to the shore by a high level bridge, anchored to the rock where a small sauna cabin rests. The project is part of a series of small interventions nestled in the mature Victorian gardens of Dun Dubh House, intended to be completed by autumn 2011.